Public Health Authorities throughout New Zealand are becoming increasingly concerned at the increase in osteoporosis in the population. Until recently the disease was regarded more as a condition of getting old, rather than as a disease which can be treated or even prevented. At present approximately 84,000 New Zealanders suffer from an osteoporosis-related fracture each year. Between 2007 and 2020, the number of osteoporotic fractures is estimated to increase by 30%, to 118,000 due to the ageing population. Already fractures resulting from bone fragility in the elderly are having a major impact on quality of life and frequently cause serious disability and death. the impact on the cost of providing healthcare services is dramatic. Osteoporotic fractures typically occur at the hip, wrist and spine, but it is fractures of the hip which are the most debilitating and costly. 12-20% of patients suffering a hip fracture die within 12 months of fracture, 15-20% require long term care and 50% of those remaining never regain independent living status. Osteoporosis is a complex disease which often develops without symptoms for many years. However, patients who have been identified as being at risk may now benefit from treatments designed to reduce or perhaps, even stop further loss of bone mass. Early detection is critical, as bone loss sufficient to cause microarchitectural deterioration simply cannot be restored, and whilst bone mass may be increased with intervention, bone structure and strength may not. Today, with the introduction of Quantitative Ultrasound (QUS), patients at greatest risk can easily be identified at an early stage. The Primary Care Physician also now has access to a number of prescriptive drug treatments that can be effective. Patients can (and should) also do a great deal to help their condition by making changes in their dietary and exercise regimes. Women and men of any age over 20 years can get a scan through Osteohealth. There is no qualifying criteria and no need for a doctor's referral. Osteohealth can organise bone health clinics at medical centres and other health outlets throughout the South Island, or your patients can come to our office in Christchurch. Contact us to organise a clinic for your patients. What is Quantitative Ultrasound Bone Sonometry (QUS)? The term ultrasound describes frequencies of sound above the human hearing threshold, which is generally accepted to be 20 kHz. Conventional 2-dimensional pulse-echo ultrasound B-Scan systems are routinely used to examine soft tissue organs and structures, but new developments now enable ultrasound to be used to characterise the physical properties of cancellous (trabecular) bone. Known as Quantitative Ultrasound (QUS), this technique utilises transmission rather than pulse-echo technique, whereby an ultrasound signal is transmitted through the bone to a receiving transducer located on the opposite side. During the transmission process, the ultrasound wave is modified by both the bone mineral density (BMD) and by the microarchitectural structure of cancellous bone. This unique combination of effects is not found in the more well known x-ray absorptiometric devices (e.g. DXA). Caution must therefore be exercised when comparing results from these different measurement modalities. What is Broadband Ultrasound Attenuation (BUA)? The attenuation of ultrasound in decibels (dB) at a particular frequency (MHz) is defined as the ratio of signal amplitude (volts) for a reference material and the measured bone. There is a substantially linear relationship between attenuation and frequency for cancellous bone between 0.2 MHz and 0.6 MHz to which a regression is applied, yielding the BUA index of units dB/MHz-1. For comparison purposes a reference trace (a measurement through de-gassed water) is stored within the C.U.B.A.Clinical unit. This defines 0db/MGz. The range of BUA observed with the C.U.B.A.Clinical in a typical population is approximately 20 to 125 dB/MGz with young healthy subjects. 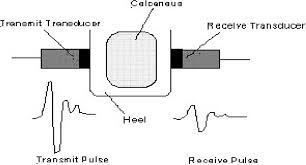 To measure BUA a complex multiple frequency ultrasound wave is transmitted through the heel bone. Acoustic coupling to the uneven surfaces of the heel is important and silicone pads fitted to the surfaces of the transducers provide the necessary contact area. Ultrasound gel is also used to ensure there are no air gaps. QUS has particular advantages over traditional x-ray methods and is especially attractive to use because it presents no risk in terms of radiation to either the patient or the healthcare professional performing the scan. The more complex the structure, the more the sound wave will be absorbed (attenuated). 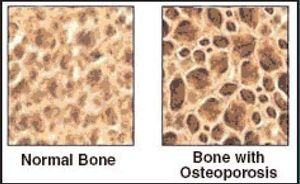 Thus normal bone will have a higher attenuation than osteoporotic bone. The trabecular orientation of bone modifies the ultrasound wave but has no effect on BMD measured by DXA. BUA is also influenced by both trabecular separation and connectivity, which is an important determinant of fracture risk. Osteoporosis erodes entire trabeculae leaving those that remain more widely separated. It is not surprising, therefore that QUS is a good predictor of fracture. While x-ray methods measure the density of bone, sonometry provides information relating to the strength of bone (structure, elasticity) which is important for determining fracture risk. This definition captures the notion that, although BMD is an important component in the determination of the risk of fracture, other characteristics of the skeleton contribute to bone fragility. In contrast, the World Health Organisation (WHO) has recommended thresholds of BMC or BMD in women to define osteoporosis but which are based solely upon prevalence. This threshold is 2.5 standard deviations below the peak bone mass expected in normal healthy young Caucasian women. This represents 15-20% of postmenopausal women as having osteoporosis when measured by DEXA at the hip or spine. Unfortunately, this second (and conflicting) definition confines the diagnosis of osteoporosis exclusively to Caucasian women measured by BMC/BMD device, and further, to the interpretation of the result solely in terms of the prevalence of low BMD in a population sample. Clearly, this does not provide for any other measurement modality to be used for the clinical diagnosis of osteoporosis, nor indeed for the introduction of any improved method of measuring the actual disease state. The WHO criteria continues to be widely used despite having been shown to have severe limitations with regards to differing modalities. The consequence is that many users of bone mineral density equipment mistakenly think that the only appropriate systems to use are those that provide a value of bone mineral density (BMD). However, DEXA measurement of BMD has serious discriminatory limitations in that many women whose BMD is measured as being normal for their age will actually suffer fractures. In fact, 50% of fractures occur in women who have been diagnosed as normal by DEXA. This is because only 75%-80% of the variance in the strength of the bone is explained by BMD. How should the WHO definition of Osteoporosis be used? The WHO criteria was originally established with measurements at the forearm using an x-ray absorptiometric technique known as SPA (single photon absorptiometry). However, with the passage of time it has become clear that a diagnosis of osteoporosis using a T score of -2.5SD as defined by the WHO should be limited to DXA of the hip. Since the introduction of the CUBA Clinical, many studies have demonstrated both the effectiveness and validity of Broadband Ultrasound Attenuation as an independent predictor of fracture risk. BUA, as uniquely measured by the McCue system, provides accuracy and precision over the full dynamic range required for bone assessment. The CUBA Clinical also includes a patented electronic phantom to monitor system calibration and stability. McCue (unlike most of its competitors) is not a DEXA manufaturer and has therefore concentrated on the development of QUS technology. The CUBA Clinical system is the flagship product of the company who have become acknowledged experts in quantitative ultrasound techniques. Early CUBA Clinical systems measured both Broadband Ultrasound Attenuation and Velocity of Sound. However, independent studies have shown that BUA is a significant predictor of fracture independent of all other parameters. Notwithstanding that VOS provides high precision measurement, it has less utility in the prediction of fracture and for this reason the CUBA Clinical now only reports BUA. Due to the high cost of DEXA scans and the difficulty in accessing this technology for many areas of New Zealand, QUS can be a convenient, cost effective pre-screen, especially for women aged over 60 years. Bone Density Clinics can be organised on a regular (6-12 monthly) basis for Medical Centres throughout the South Island. How do I Interpret QUS Measurements? Independent clinical studies have clearly demonstrated that the CUBA Clinical identities individuals (women and men) at risk of fracture. The CUBA Clinical value for determining risk is a T-score of -2SD or below. This risk assessment can be used in combination with other clinical risk factors to determine the need for further investigation and treatment. Note that the ISCD have recommended that Z scores be used in preference to T scores for men under the age of 65 and women prior to menopause. Osteoporosis should only be diagnosed in these groups if there are additional factors such as fracture. Can the CUBA Clinical Discriminate Between Osteoporotic, Osteopenic and Normal Subjects? In 1997 Dr Susan Greenspan from Beth Israel Deaconess Medical Centre in Boston, Massachusetts, published data from a study to determine whether the measurement of skeletal status at the calcaneus was useful for the diagnosis of osteoporosis. She tested 5 calcaneal devices including the CUBA Clinical to determine the precision and discriminatory ability between osteoporotic and normal subjects. Dr Greenspan found that the correlations between the five calcaneal instruments were strong, 0.80 - 0.91 and that they all discriminated between osteoporotic and normal subjects. Using ROC analysis, Dr Greenspan determined that the CUBA Clinical had an AUC value of 0.90, as compared to DEXA femoral neck 0.93, DEXA trochanter 0.90 an DEXA calcaneus 0.88. Why Does the CUBA Clinical use the Heel as the Measurement Site? The measurement of BUA requires that the ultrasound signal is transmitted through the bone and received on the exit side. The ideal site would be the hip, but for anatomical reasons this is not practical. However, BUA measured at the calcaneus provides and accurate indication of fracture risk, particularly for the hip. How Accurate is the CUBAClinical? According to the F.D.A. "The McCue CUBAClinical is safe and effective as a clinical indicator of skeletal status with performance comparable to that of bone mineral density measurements [ie. DEXA and SEXA scans]. Skeletal status and relative risk of fracture can be evaluated without the need for exposure to the ionizing radiation produced by the BMD devices [ie. DEXA and SEXA]." What Evidence is There to Support the Claim That the CUBA Clinical Can Actually Predict Fracture? Does QUS Predict Fracture in Any Age Group? The prospective fracture studies reported for both DEXA and QUS devices specifically enrolled elderly subjects because they were likely to develop fractures within the study period 2-3 years. If a younger population (age 40) were to have been enrolled, the time needed to obtain data would have been some 20-30 years. For this reason, certain organisations and researchers represent that QUS can only predict fractures in the elderly. Does the CUBA Clinical Predict Fracture in Men? How Does the CUBA Clinical Compensate for Edema? The CUBA Clinical is a true contact system. When the transducers make direct contact with the measurement site, a light but constant pressure is applied. Before the measurement takes place, an automatic 30 second settling time removes the majority of any edematous fluid and allows for the accurate measurement of heel width. The measurement algorithm allows for any additional edema that may be present in some patients after the 30 second settling period. Ref 7: Vogel JM, Wasnich RD, Ross PD. The clinical relevance of calcaneus bone mineral measurements: a review. Bone Miner. 1988 Oct;5(1):35-58. Ref 8: Etherington J, Keeling J, Bramley R, Swaminathan R, McCurdie I, Spector T. The Effects of 10 Weeks Military Training on Heel Ultrasound and Bone Turnover. Calcified Tissue International 1999, Vol 64.